You'll be £14.99 closer to your next £10.00 credit when you purchase London’s East End. What's this? The East End is one of the most famous parts of London and it has had its own distinctive identity since the district was first settled in medieval times. It is best known for extremes of poverty and deprivation, for strong political and social movements, and for the extraordinary mix of immigrants who have shaped its history. Jonathan Oates’s handbook is the ideal guide to its complex, rich and varied story and it is an essential source for anyone who wants to find out about an East End ancestor or carry out their own research into the area. He outlines in vivid detail the development of the neighbourhoods that constitute the East End. In a series of information-filled chapters, he explores East End industries and employment – the docks, warehouses, factories, markets and shops. He looks at its historic poverty and describes how it gained a reputation for criminality, partly because of notorious criminals like Jack the Ripper and the Krays. This dark side to the history contrasts with the liveliness of the East End entertainments and the strong social bonds of the immigrants who made their home there – Huguenots, Jews, Bangladeshis and many others. Throughout the book details are given of the records that researchers can consult in order to delve into the history for themselves – online sites, archives, libraries, books and museums. 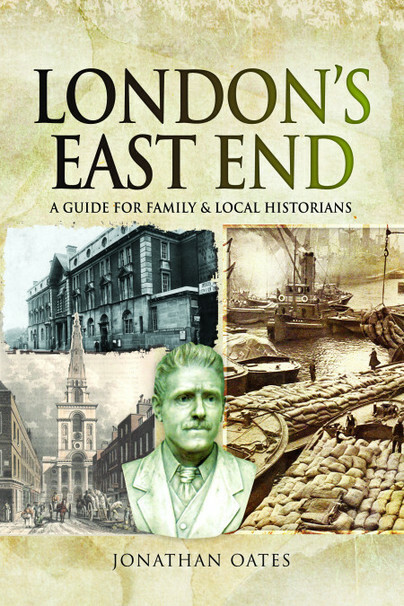 All in all, this is a well-constructed, essential addition to the bookshelf for anyone with East End ancestry, or having general interest in family or local history in the area.